[S4] GRO Indexes to Deaths "1878/Q1 Holborn 1b 491." [S327] Copy marriage certificate of Charles Clifford Uridge and Sarah Ann Wheeler (December 26, 1890) . "Father shown as William Burker Uridge, deceased." [S401] Original marriage certificate of William Uridge and Sarah Rance (19 December 1847). [S3] GRO Indexes to Marriages "1847/Q4 St. Martin 1 159." [S400] Copy death certificate of Sarah Uridge (28 June 1860). [S4] GRO Indexes to Deaths "1860/Q3 St Geo H Sq 1a 141." [S4] GRO Indexes to Deaths "1878/Q1 Holborn 1b 491 Age 54." [S3] GRO Indexes to Marriages "1851/Q2 URIDGE, William St. Pancras 1 346." [S852] Copy of Parish Register entry, William Uridge & Sarah Gurney marriage of 19 April 1851. [S4] GRO Indexes to Deaths "1889/Q2 URIDGE, Sarah Holborn 1b 424 age 59." [S4] GRO Indexes to Deaths "1897/Q1 URIDGE, William Holborn 1b 468 age 70." [S4] GRO Indexes to Deaths "1896/Q3 URIDGE, William Henry Islington 1b 247 age 62." [S79] London Metropolitan Archives, LMA X085/097 Page 201 Islington, Middlesex. [S3] GRO Indexes to Marriages "1858/Q3 URIDGE, William Henry = JANES, Mary Ann Islington 1b 302." [S1075] 1881 Census RG11 Piece 0251 Folio 67 Page 24. [S1076] 1891 Census PRO Ref RG12 Piece 164 Folio 95 Page 16. [S11] Index to Wills, 1860 to 1989, URIDGE William Henry of 52 Wall Street Ball's Pond Middlesex ornamental printer Died 10 September 1896 Probate London 5 October to Mary Ann URIDGE widow Effects £ 389 3s 4d. [S959] Website Rootsweb (http://www.rootsweb.com) http://freepages.genealogy.rootsweb.com/~abneypark/name/…. 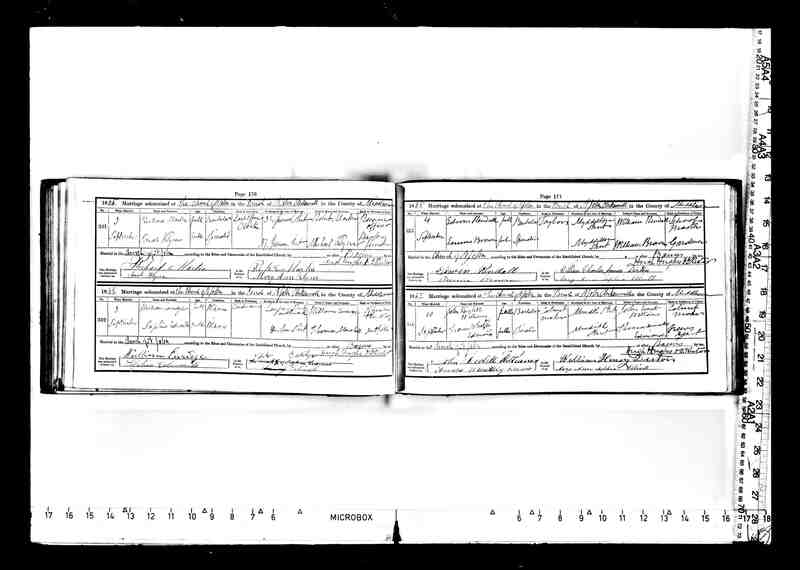 Burial Record: 095332; Section: G06; Index 4S06. 27 December 2001. [S4] GRO Indexes to Deaths "1908/Q1 URIDGE, Mary Ann Islington 1b 239 age 71." [S11] Index to Wills, 1860 to 1989, URIDGE Mary Ann of 52 Wall Street Balls Pond Road Islington Middlesex widow Died 3 March 1908 Probate London 27 March to Joseph TRENDLE carpenter & Mary Louisa HOLLAND widow Effects £ 287 10s 3d. [S4] GRO Indexes to Deaths "1857/Q2 Tunbridge 2a 224." [S715] Will of William Potter, dated 4 December 1849. [S717] Transcript of Will of William Potter, dated 4 December 1849. Kindly transcribed by Hilary Grant-Nelson. [S743] International Genealogical Index - IGI Microfiche 1978 & 1981States name as FOSTER. [S267] Will of Edgar Uridge, dated 20 Apr 1853 Will of Edgar Uridge, dated 20 Apr 1853 Proved at London the 3rd September 1853 before the Judge by the oaths of Sarah URIDGE Widow the Relect and the Reverend Thomas Dove the Executors to whom Administration was granted having been first sworn duly to administer by Commission. [S714] E-mail from Hilary Grant-Nelson to Teresa Pask dated 27 November 2005. [S716] Transcript of Will of Sarah Uridge, dated 22 September 1853, with codicil dated 9 February 1854. Kindly transcribed by Hilary Grant-Nelson. [S714] E-mail from Hilary Grant-Nelson to Teresa Pask dated 29 November 2005. [S4] GRO Indexes to Deaths "1853/Q4 URIDGE, Sarah Cranbrook 2a 287 age 47." [S3] GRO Indexes to Marriages "1845/Q2 Croydon 4 72." [S1074] 1871 Census gives age 54 therefore born 1817. [S1075] 1881 Census RG11 Piece 0737 Folio 12 Page 24. [S962] Website FreeBMD (http://www.freebmd.org.uk/) search 10 March 2002 : Matched entry. [S4] GRO Indexes to Deaths "1882/Q2 Lewisham 1d 631 Age 62." [S127] Baptisms Transcript, St. Bartholomews, Sydenham, Kent, 1832-1919 "Mary Ann d George & Ann UREDGE, Bricklayer, Sydenham." [S4] GRO Indexes to Deaths "1878/Q1 Lewisham 1d 694 Age 58." [S955] Vital Records Index: British Isles 1998 CD ROM First EditionFHL Number 994331. Research Note: Baptism needs to be verified, as it does not concur with birth date. [S4] GRO Indexes to Deaths "1849/Q4 URIDGE, John Allander Godstone 4 135 (Died in March, but not registered until 4th Quarter)." [S113] Index to Burials and Tombstones, 17 November 2001, Monumental Inscription: Sacred to the memory of John Allender URIDGE born November 27, 1787, died March 14, 1849. "In the midst of life we are in death." [S16] Letter from John R. Thomas to Teresa Pask: East Grinstead Baptisms. [S47] Index of Baptisms, Marriages & Burials in the Parish of East Grinstead, Sussex. [S113] Index to Burials and Tombstones, 17 November 2001, MI stated born 27 November 1787. [S950] Website Family Search (LDS) (http://www.familysearch.org) M055631 1813 - 1815 0307696 Film 6906151. [S4] GRO Indexes to Deaths "1870/Q3 URIDGE, Jane E. Grinstead 2b 99 age 75 (Died on 11 January 1870, but not registered until 1870/Q3." [S11] Index to Wills, 1860 to 1989, The will of Jane URIDGE late of Copthorne Worth in the country of Sussex widow deceased who died 11 January 1870 at Copthorne aforesaid was proved at Lewes by the oaths of John Thomas URIDGE of Copthorne aforesaid Beerhouse Keeper the son and Alfred PACKHAM of Horley in the county of Surrey Carpenter the Executors. Effects under £300. [S467] Copy marriage certificate of John Thomas Uridge and Mary Ann Worsell (3 May 1882). [S6] Teresa Pask's Guesses, Theories and Speculation : Based on probate of her brother John Thomas URIDGE. [S6] Teresa Pask's Guesses, Theories and Speculation : Based on date of marriage. [S955] Vital Records Index: British Isles 1998 CD ROM First EditionFHL Number 1067107. [S955] Vital Records Index: British Isles 1998 CD ROM First EditionFHL Number 1067108. [S891] Image of the 1841 Census census for Virginia Row, St Matthew Bethnal Green, Tower Hamlets, London: HO107 Piece 693 Book 4/48 Folio 26 "(aged 29 born 1812)." [S662] Image of the 1881 census for Hammersmith, London: RG11 Piece 0374 Folio 111 Page 16 "(aged 36 born 1815)." [S663] Image of the 1861 census for 12 Mint Street, St. George, Southwark, London: RG9 Piece 0327 Folio 5 Page 4 Indexed incorrectly under the name of ENRIDGE "(aged 47 born in 1814)." [S381] Copy marriage certificate of William Euridge and Jane Elizabeth Tranter (16 April 1849). [S892] Copy of Parish Register entry, William Euridge & Sophia Edwards marriage of 3 September 1865. [S890] Transcript of the marriage of William Euridge and Elizabeth Doughty, 03 Jun 1833. [S1035] Website Ancestry London Marriages & Banns 1754-1921 (http://www.ancestry.co.uk) William Euridge Spouse Name: Elizabeth Doughty Record Type: Marriage Marriage Date: 03 Jun 1833 Parish: St George the Martyr County: Surrey Borough: Southwark. [S1036] Website Ancestry London Deaths & Burials, 1813-1980 (http://www.ancestry.co.uk) Elizabeth Euridge Record Type: Burial Estimated Death Date: abt 1847 Burial Date: 24 Nov 1847 Age: 32 Estimated birth year: abt 1815 Parish or Poor Law Union: St George the Martyr Borough: Southwark County: Surrey. [S220] Copy death certificate of Jane Euridge (31 December 1864). [S3] GRO Indexes to Marriages "1849/Q2 EURIDGE, William = TRANTER, Jane Elizabeth Bethnal Green 2 48." [S889] Transcript of the marriage of William Euridge and Jane Elizabeth Tranter, 16 April 1849. [S4] GRO Indexes to Deaths "1864/Q4 EURIDGE, Jane St George Southwark 1d 103 age 39." [S1035] Website Ancestry London Marriages & Banns 1754-1921 (http://www.ancestry.co.uk) William Enridge Age: Full Age Estimated birth year: abt 1865 Spouse Name: Sophia Edwards Record Type: Marriage Marriage Date: 03 Sep 1865 Parish: St John, Clerkenwell County: Middlesex Borough: Islington Father Name: William Enridge Spouse Father Name: Thomas Marshall. [S3] GRO Indexes to Marriages "1865/Q3 ENRIDGE, William = EDWARDS, Sophia Clerkenwell 1b 989." [S4] GRO Indexes to Deaths "1906/Q4 EURIDGE, William West Ham 4a 196 age 62." [S1034] Website Ancestry London Births & Baptisms 1813-1906 (http://www.ancestry.co.uk) Elizabeth Phebe Euridge Record Type: Baptism Estimated Birth Date: abt 1846 Baptism Date: 15 Mar 1846 Father's name: William Euridge Mother's name: Elizabeth Euridge Parish or Poor Law Union: St George the Martyr Borough: Southwark Date of Birth: 25 December 1838. [S215] Copy marriage certificate of John Euridge and Mary Ann Rayner (2 June 1873). [S216] Copy marriage certificate of John Euridge and Jane Elizabeth Taylor (2 August 1880). [S1034] Website Ancestry London Births & Baptisms 1813-1906 (http://www.ancestry.co.uk) John Euridge Record Type: Baptism Estimated Birth Date: abt 1846 Baptism Date: 15 Mar 1846 Father's name: William Euridge Mother's name: Elizabeth Euridge Parish or Poor Law Union: St George the Martyr Borough: Southwark. [S221] Copy death certificate of Mary Jane Euridge (23 March 1865). [S4] GRO Indexes to Deaths "1847/Q4 EURIDGE, Elizabeth St George Southwark 4 412." [S46] Index of Baptisms, Marriages & Burials in the Parish of St. Nicholas, Sevenoaks, Kent. [S6] Teresa Pask's Guesses, Theories and Speculation : Based on date of birth of child. [S33] Index of Baptisms, Marriages & Burials in the Parish of Chiddingstone, Kent.